The price of rice has and is skyrocketing in the Nigeria market today after the country slips into recession. A bag of rice sold for about N8,000 then is now N19,000 which makes it unaffordable for most Nigerians. 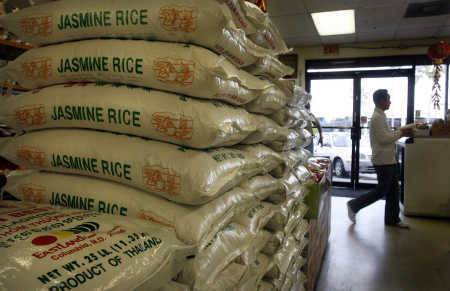 The Nigerian Government banned rice importation so as to increase and encourage local rice production and consumption. Though it looks like a good policy, it will amaze you that even the local rice are all expensive too. As a result of high demand for the seeming unavailable local rice, the price of the commodity went up. If Federal Government of Nigeria can create one unique association for all the rice production companies in Nigeria and urge them to join, it will be quite very nice and increase mutual understanding on policies that will enhance good outputs and help solve common challenges facing them. Federal Government of Nigeria should try as much to provide these companies with necessary aids and funds that will help increase and strengthen their productions, this won't be a hard task for the Government cause the funds will be recouped from taxes on this companies. Also, provision of free fertilizer and checks of diversion of this aids should be handled properly. It will be a thing of dismay if these companies find it hard to transport their productions to markets due to bad roads, and it is the duty of Government to provides this structures to help easy and quick distribution across the country. If we want our rice quality to enhance, we have to seek help from good experts that will teach those companies on how to improve their production to match foreign standards and also on how to operate modern engines. Each in every of the rice companies must make sure the adequate distribution of rice's across the country by creating depots in the necessary places, it won't only help to ensure easy distribution, it will help them in market expansion and outreach their distribution units and capacity. Lastly, Nigeria Media also has a part to play in the mobilization of people and encourage them to buy and patronize Local Products or else these companies cannot be sustained which may lead to their collapse, so this is the very important issue. Nigeria media can also provide free adverts for these companies for a limited amount of time.